Man has always been a nomad, a restless spirit or a free-spirited species. In very early times, we moved from place to place, from continent to continent, tracking the stars, crossing huge rivers, and following the seasons in our efforts to survive. Before the advent of modern civilization as we know it, it was common for man to travel great swathes of lands and territories. But they didn't remain like that forever, the free-spirited nomadic men; they began to change their orientation. They began to try to find ways to stay in a place longer than usual. They had an urge to own lands, to build a connection to the lands. There was a plea for stability and so any semblance to a regular life, one that does not involve old moving habits, is embraced by us. We continue to bury our nomadic essence deeper into our core. We spend a lot of our time, energy, and money paying for a lot of things in our possession already. The all too popular culture of getting it now and paying later has been a resonant motto for most men. This exemplifies the way we see the world and our current approach to survival. This speaks to the state of our complacency and our inability to remove ourselves from our self-inflicted burdens of excruciating debts and our monotonous 9-5 daily obligations. But not everybody wants to live that way: It is about having a newfound freedom, working with no boundaries or borders. The ability to finally live and work from any workstation in the world. 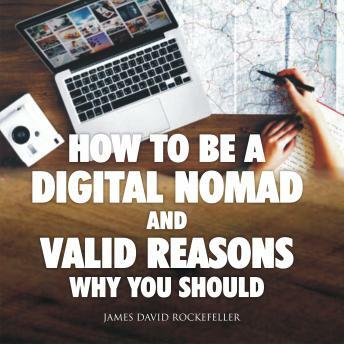 It is called being a digital nomad."